So join me as I take a look at five Websites that, once upon a time, we simply couldn't live without, but which are either no longer with us, or have perhaps seen better days. Once of the original Internet startups created back in 1995, GeoCities offered everybody their very own homepage. Although HTML at the time was pretty easy to master, GeoCities offered tools that made creating pages a matter of a few clicks. And it was all free. Back then declaring you had your own home page would stop a conversation. Women would swoon and men would regard you jealously. Just about anybody could create a Website using GeoCities. Sadly, nearly everybody did. It became clear that graphic design skills are not a dominant characteristic among the American population. Most pages looked like somebody had taken a load of animated GIFs, put a stick of lit dynamite under them, and retired to a safe distance. GeoCities' gimmick was to build its online community around a geographical location model. Pages of a supposedly financial orientation would end-up under the WallStreet heading, for example, while celebrity gossip would end up in the Hollywood section. This was a potent concept back in 1999, weak as it might sound today -- so much so that GeoCities claimed one third of all Web visitors as the 20th century came to a close. Then again, AOL accounted for even more at the time, so you have to question our priorities back then. So what happened to GeoCities? Yahoo. Conditions and rules were imposed to tame what was turning into the wild west of the Internet; in the late 90s and early 00s, searching for illegal stuff, such as pirated software or dodgy MP3s, would invariably lead to a GeoCities page. The ease of creating pages had turned into a hindrance. Policing so many pages was a logistical nightmare. But, most of all, the Internet simply moved on. Fashions changed. Blogs and wikis came along, and it just wasn't cool any longer to have a static home page. Home pages belonged to an era of 14-inch monitors and floppy diskettes. In 2009, Yahoo! discontinued GeoCities, although -- like many of the best things in life -- it's available in Japan. Its demise was greeted with dismay. Several commentators suggested that GeoCities was the first example of how it's impossible for an online service to make money. But we must never forget how important GeoCities was in the evolution of the Internet. It showed people were willing to express themselves online. It proved the Internet was first and foremost a community. And it was the best place to find dodgy MP3s. Somebody transported in time from 1999 might be forgiven for thinking that MySpace was GeoCities' natural successor. They would have a point. Home pages are replaced with MySpace Profiles, and the whole thing is glued together via a social networking overlay, but there are distinct similarities. In particular, the same eye-scratching, soul-destroying design is still a feature, although a typical MySpace profile benefits from music that starts to play automatically and reflects the individual's taste in music (or lack thereof). Both sites are or were about creating communities. However, the key difference is that users can choose to make their MySpace profiles private, so that only people they've "friended" can access it. Additionally, MySpace features other social networking tools such as messaging, the ability to create groups of friends, blogging, and so on. MySpace has always been rough and ready. It's about putting your personality online. This should have succeeded but it didn't, and Facebook's more rigid approach focusing on status updates has ultimately proved more appealing. Perhaps the biggest difference was setup: MySpace was all about personalization, which had to be done before you could get down to the business of finding friends, while Facebook let you get going straight away. Over recent years MySpace has become most popular with musicians and performers, who appreciate its multimedia-friendly orientatio, something that's still largely lacking in Facebook. This ultimately led to MySpace being rebranded as an entertainment portal, although some have questioned its decision to focus exclusively on the under 30s age group. 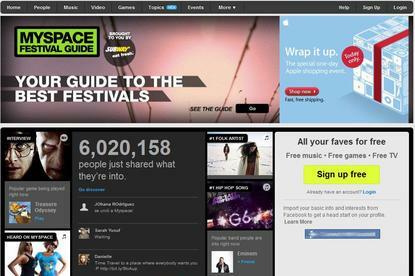 MySpace is still a giant in the social networking space, but it's losing visitors by the handful as time goes on. Tie-ins with Facebook aside, the writing appears to be on the wall. Hotmail was the first Web-based e-mail service and, perhaps surprisingly, is still the best, if total number of users is any measure: It has 364 million users, according to Internet market researchers comScore. It pushes Yahoo Mail into second place, and third in the ranking of Webmail providers is Google's Gmail. Nowadays Hotmail is known as Windows Live Hotmail, and has been owned by Microsoft for nearly 14 years. Microsoft tried to lose the Hotmail name in 2005 during one of its many brand juggling exercises, but decided against it when users pointed out that they felt reassured by the name. I was once a Hotmail user. My old account is probably still there somewhere, although I've long forgotten the log-in details. I wasn't alone. Anybody who was smart and tech-savvy in the late 90s and early 00s realized that Web-based e-mail was massively more convenient than using an e-mail client. Now it's different. My own prejudices come to the fore whenever I receive a message from a Hotmail address: I feel I'm dealing with somebody who knows something about computers, but perhaps not a lot. If they knew more, my twisted logic tells me, they wouldn't be using Hotmail. Instead, they'd be using Gmail, like the rest of us cool kids. But at least they're not stupid enough to use the e-mail address provided by their ISP, which makes as much sense as accepting free samples from a drug dealer. I'm always left wondering why anybody would want to use Hotmail. The ads are intrusive and annoying. It took until June for them to finally remove the annoying tagline ads that were added to every single e-mail sent through the service. The interface is clunky and slow, and the whole shebang is tied into Windows Live (previously known as MSN/Passport), Microsoft's also-ran attempt to keep-up with Google. Unsurprisingly, this is rather biased towards those who use Windows computers. At one point Linux users were locked out of Hotmail and were only allowed read-only access. Hotmail's failing was that, once upon a time, it was pioneering and clever, but then fell into a period of stagnation. It took the launch of Gmail to provide a kick up the derrière so that significant improvements were made. But by that point it was too late. Hotmail was having to catch up. I don't know about you but I'm always left with a sour taste in the mouth when a service I use improves only when its competitors force it to do so. That doesn't seem the right way to treat customers. Ah, Slashdot. I have such fond memories of you. We'd spend days together, reading geeky news stories that seemed really important at the time. Where else could I find out about a new battery technology that will change the world (but never actually did)? Where else could I hear the latest crazed proclamation from Richard Stallman? Where else could I argue pointlessly with fellow geeks and prove my masculinity by writing a witty reply that only 0.0001% of the population could understand? If you ever get bored, try searching Slashdot for passive aggressive phrases; "I think you'll find" has been said almost 27,000 times by various commentators, for example. Slashdot was cool back when Linux was cool. Yes, that long ago. At times it's been referred to as a communal blog and a news aggregator. Its definition seems to change depending on what Internet technology is fashionable. Unsurprisingly, now it's referred to as a social news site. Slashdot is the grandfather of sites such as Reddit and Digg, of course, which do the same thing, only better. Before it clambered onto the slippery slope itself, Digg was arguably nothing more than Slashdot for teenagers. Attempts by Slashdot management to draw new readers lead to the creation of the Idle section, which expands the geek news brief to include Reddit- and Digg-like funny stories, pictures, and videos. It's hardly been a success, and it feels like a dad trying to disco dance at his daughter's birthday party. A "slashdotting" could bring down a Website, back when the Internet was held together with elastic bands and had a beer coaster shoved under its leg to stop it wobbling. A mention on the Slashdot front page would drive hundreds of thousands of visitors to a Website. Times change. The recent slashdotting of an article here on PC World's blog pages lead to a modest increase in traffic, but it was quite a bit short of what we might have expected in the old days. This is evident on Slashdot itself; in the old days front-page articles would draw at least 600 comments, if not more. Currently, getting beyond 300 is unusual. While it might not be as popular as it once was, Slashdot keeps on going, catering to its core market like no other news site on the planet. Nobody is more in tune with the pure geek spirit. It's hard to believe that there are young people reading this who might never have used AltaVista. In the late 1990s it was the only search engine worth using. This was when finding stuff online took actual skill. You might think you're clever using the likes of operators in your Google search, but back then it was all about crafting the perfect search phrase. If you didn't get the results you wanted you phrased your search query differently and had another try. Eventually you'd find what you were interested in. Probably. It's also hard to believe that, back then, not all search engines indexed the entire Web. They kept the exact figures under wraps, but some search engines were more knowledgeable than others. AltaVista was arguably the best of all, and this inspired confidence in its users. It's probably obvious what appeared on the horizon and eventually brought carnage: Google. I'm a very faithful person and wasn't about to give up on AltaVista, but I remember the first few times I used Google, sometime around 2000. In comparison to AltaVista, Google seemed to have a second sense of what I was looking for. Backing up my decision to move was the fact that AltaVista had become a Web portal, in an attempt to keep up with Yahoo, which was dominant at the time. Just like modern-day Google, one of AltaVista's strongest points had always been its simplicity and uncluttered interface. In fact, Google pretty much copied AltaVista's old look and feel in those early days, something that's remained broadly unchanged on the Google home page up until this day.